"Spin the Bottle presents a fresh new challenge to critically analyze the impact of alcohol on our relationships,health, and ultimately our future." "Media critics Jackson Katz and Jean Kilbourne have done it again... A dramatic and sobering assessment of alcohol use, abuse, and the targeted marketing of young people; this video should be required viewing--from high school to college and beyond." "What if methamphetamine, crack, and heroin were promoted and marketed in the same way as alcohol: i.e., associating health, sexual prowess, popularity, and happiness with a substance that when abused can lead to the exact opposites? 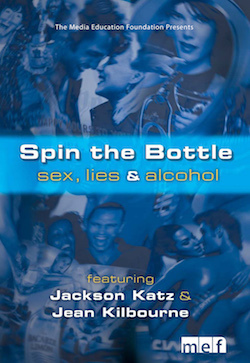 In Spin the Bottle, passionate media and substance abuse critics Jackston Katz and Jean Kilbourne deliver rapid-fire indictments of the subculture of alcohol abuse that exists on many college campuses nationwide, interspersed with interviews from college students who relate their mostly unpleasant experiences with alcohol abuse (unwanted pregnancies, hospitalizations, public urination, and lots of puking)... A sobering look at the truth behind the happy face that advertising and media put on a contemporary social disease, this is highly recommended." "An important examination of the many cultural facets related to collegiate high-risk drinking." "Spin the Bottle is a wonderful resource for anyone working to reduce alcohol-related problems on college campuses. It presents the issues in a non-threatening, appealing manner and encourages students to make safe and responsible choices." "An excellent tool for use in counseling centers, in community gatherings and church discussion groups, and especially in high school and college orientations and classrooms."